XLRI Jamshedpur's Executive Development Program on "Finance for Non-Finance Managers" in New Delhi, India from Banking & Finance Industry Program for Everyone !!! 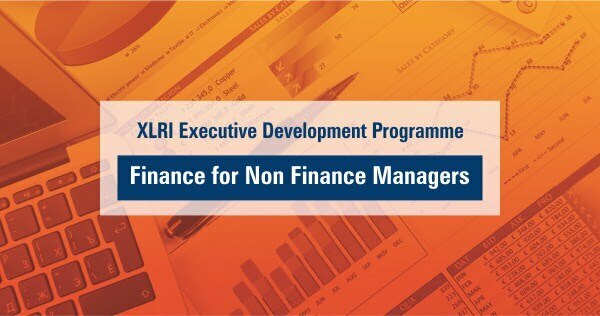 XLRI Jamshedpur's Executive Development Program on "Finance for Non-Finance Managers"
Program Objective: The primary objective of this programme is to provide all working executives with a beginner’s level understanding of aspects of accounting and finance that will complement their management skills. The programme will also help in laying down the foundations that would be required to gain a subsequent understanding of advanced topics in finance and accounting. Programme Highlights: · Immensely useful programme to teach technical managers to interpret and comfortably use financial data to better run their organizations · Learn how to recognize capabilities for products that create value for their customers, and learn to appreciate the many corporate finance concepts including cost of capital, economic value added and market value added · Course content and structure designed entirely by XLRI Jamshedpur · Lectures imparted by eminent faculty and Industry experts · Certificate of Completion from XLRI Jamshedpur · Online interactive lectures · Convenient Weekend Timing- Sunday Classes · Learn from Anywhere – No need to travel to an institute or training center Eligibility: · For Indian Participants - Graduates (10+2+3) or Diploma Holders (only 10+2+3) from a recognized university (UGC/AICTE/DEC/AIU/State Government) in any discipline. · For International Participants- Graduation or equivalent degree from any recognized Univ. or Institution in their respective country. Who Should Attend: One of the problems facing many non-finance executives is their inability to understand and apply basic principles of finance and accounting to their day-to-day and longer-term management activities. It’s one thing to oversee product innovation or technological implementation. It’s another to be able to use financial tools to address senior management’s concerns about risk, or to persuade corporate finance to fund your projects. Herein, we have designed a special program to take the mystery out of finance. The program will teach you how to deal with corporate finance, to understand how funding decisions are made and how you can influence those decisions by applying financial principles to project evaluation and resource allocation. This is a program meant to teach technical managers to interpret and comfortably use financial data to better run their organizations and to work more effectively with the financial managers of the organization. Participants learn how to recognize capabilities for products that create value for their customers, and learn to appreciate the many corporate finance concepts including cost of capital, economic value added and market value added. They also learn how to spot profitable projects, and how to capture the value of those projects. Program Contents: Part 1: Accounting Tools for Value Management (12 Hours) Financial Analysis Applications for Value Management Evaluation & Assessment of Short-Term Business Growth Using Cash Flow information for Decision Making Decision Making & Business Risk Assessment using Cost Based Information Part 2: Corporate Finance Concepts & Tools for Value Creation & Management (18 hours) Financing Choices & Management of Cost of Capital Evaluating Long-Term Investment Decisions Managing Working Capital Business Valuation Approaches and Analysis of Value Drivers Economic Value Measurement and Management Balanced Scorecard for Value Management-The Financial Perspective About Faculty: Ram Kumar Kakani, B. Tech (Andhra Univ. ), FPM (IIM Calcutta) Ram is associated with XLRI Jamshedpur for the past 15+ years. Earlier he started his career as a technocrat in the corporate manufacturing sector and then gradually moved towards the academic sector with a focus towards honing aspects related to Finance-Performance-Strategy trilogy at the IIM Calcutta. In the last few years, Ram has moved towards Leadership domain, practicing his leadership development skills with focus on Public Administrators as Director of National Center for Leadership Development and Competency Assessment (NCLDCA), a Government of India initiative. Ram is certified as a Leadership Coach, Facilitator and Trainer for entry-level and mid-level IAS and other Civil Service officers by CCL (Center for Creative Leadership) USA & GIZ Germany. Thus, his areas of interest include a gamut ranging from Accounting Analysis to Corporate Valuation to Leadership Development. Pedagogy: The pedagogy will comprise lectures, case discussions, and analytical exercises imparted by the Finance faculty with rich experience of teaching from the Americas to Europe. Select industry experts would also be included to provide practical insights to resolving the everyday financial problems. Concepts will be explained using examples drawn from the real life. Duration: 30 hours spread over 10 to 12 weeks i.e. 3 Months on weekends (Sun) Programme Start Date: Sep 24, 2017 (Every Sunday 3:00 to 6:00 PM) Last Date to Enroll: Sep 15, 2017 (Fri) Programme Fee: Rs 36,000/- + Applicable Tax Program Link: http://sat.xlri.ac.in/emdp/programme.php?stat=r11 Methodology: Assignments / Projects: The final decision on evaluation methods rests with the institute and may change without prior intimation. Based on the performance in the assessments, participants are awarded grades (Excellent, Good, Average, Poor). Certification: Eligibility for Certification: Attendance - 80% and Evaluation - will be done based on (a) regular assignments + (b) regular viva voce + (c) class participation. Participants who successfully complete the same along with the requisite attendance criteria will be awarded a certificate of participation (for non-successful participants) and certificate of completion (for successful participants) by XLRI.